SeaWorld owns 11 aquatic parks across the U.S.. In addition to SeaWorld parks, it operates Aquatica, Busch Gardens and Sesame Place (an entire park devoted, yes, to Sesame Street). All told, SeaWorld Entertainment has 93 different attractions. The company has about 67,000 animals including 29 killer whales the centerpieces of SeaWorld’s Shamu shows. 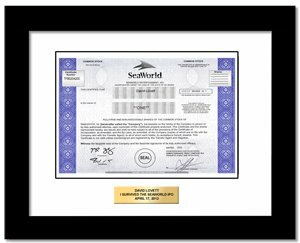 As of Aug 2013, SeaWorld stopped issuing paper stock certificates and registers ownership electronically instead. The recipient still becomes a real shareholder of SeaWorld Ent. Inc. with all associated rights.